For other uses, see Elis (disambiguation). Elis /ˈɛlɪs/ or Eleia /ɛˈlaɪ.ə/ (Greek: Ήλιδα, translit. Ilida, Attic Greek: Ἦλις, translit. Ēlis /ɛ̂ːlis/; Elean: Ϝᾶλις /wâːlis/, ethnonym: Ϝᾱλείοι) is an ancient district that corresponds to the modern regional unit of Elis. Elis is in southern Greece on the Peloponnese, bounded on the north by Achaea, east by Arcadia, south by Messenia, and west by the Ionian Sea. Over the course of the archaic and classical periods, the polis "city-state" of Elis controlled much of the region of Elis, most probably through unequal treaties with other cities; many inhabitants of Elis were Perioeci—autonomous free non-citizens. Perioeci, unlike other Spartans, could travel freely between cities. Thus the polis of Elis was formed. Homer mentions that Elis participated in the Trojan War. The first Olympic festival was organized in Elian land - Olympia - by the authorities of Elis in the eighth century BC, with tradition dating the first games to 776 BC. The Hellanodikai, the judges of the Games, were of Elian origin. The local form of the name was Valis, or Valeia, and its meaning, in all probability was, "the lowland" (compare with the word "valley"). 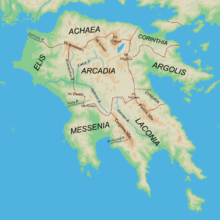 In its physical constitution Elis is similar to Achaea and Arcadia; its mountains are mere offshoots of the Arcadian highlands, and its principal rivers are fed by Arcadian springs. According to Strabo, the first settlement was created by Oxylus the Aetolian who invaded there and subjugated the residents. The city of Elis underwent synoecism—as Strabo notes—in 471 BC. Elis held authority over the site of Olympia and the Olympic games. The spirit of the games had influenced the formation of the market: apart from the bouleuterion, the place the boule "citizen's council" met, which was in one of the gymnasia, most of the other buildings were related to the games, including two gymnasia, a palaestra, and the House of the Hellanodikai. Triphylia (Τριφυλία Triphūlía "Country of the Three Tribes"). Koilē Elis, the largest and most northern of the three, was watered by the river Peneus and its tributary, the Ladon. The district was famous during antiquity for its cattle and horses. Pisatis extended south from Koilē Elis to the right bank of the river Alpheios, and was divided into eight departments named after as many towns. Triphylia stretched south from the Alpheios to the river Neda. Nowadays Elis is a small village of 150 citizens located 14 kilometres (8.7 mi) NE of Amaliada, built over the ruins of the ancient town. It has a museum that contains treasures, discovered in various excavations. It also has one of the most well-preserved ancient theaters in Greece. Built in the fourth century BC, the theater had a capacity of 8,000 people; below it, Early Helladic, sub-Mycenaean and Protogeometric graves have been found. Elis was a traditional ally of Sparta, but the city state joined Argos and Athens in an alliance against Sparta around 420 BC during the Peloponnesian War. This was due to Spartan support for the independence of Lepreum. As punishment following the surrender of Athens, Elis was forced to surrender Triphylia in 399 BC, and the territory was permanently ceded to Arcadia in 369 BC. Eric W. Robinson has argued that Elis was a democracy by around 500 BC, on the basis of early inscriptions which suggest that the people (the dāmos) could make and change laws. Robinson further believes that literary sources imply that Elis continued to be democratic until 365, when an oligarchic faction seems to have taken control (Xen. Hell. 7.4.16, 26). :29–31 At some point in the mid-fourth century, democracy may have been restored; at least, we hear that a particularly narrow oligarchy was replaced by a new constitution designed by Phormio of Elis, a student of Plato (Arist. Pol. 1306a12-16; Plut. Mor. 805d, 1126c). And when he was once asked by some one who were the wickedest people, he said, "That in Pamphylia, the people of Phaselis were the worst; but that the Sidetae were the worst in the whole world." And when he was asked again, according to the account given by Hegesander, which were the greatest barbarians, the Boeotians or the Thessalians he said, "The Eleans." In Hesychius (s.v. βαρβαρόφωνοι) and other ancient lexica, Eleans are also listed as barbarophones. Indeed, the North-West Doric dialect of Elis is, after the Aeolic dialects, one of the most difficult for the modern reader of epigraphic texts. ^ Miller, D. Gary (2014). Ancient Greek Dialects and Early Authors: Introduction to the Dialect Mixture in Homer, with Notes on Lyric and Herodotus. De Gruyter. p. 185. ISBN 978-1-61451-295-0. ^ Roy, J. (2002). "The Synoikism of Elis". In Nielsen, T. H. (ed.). Even More Studies in the Ancient Greek Polis. Stuttgart: Steiner. pp. 249–264. ISBN 3-515-08102-X. ^ Strabo; trans. by H. C. Hamilton & W. Falconer (1856). "Chapter III. GREECE. ELIS.". Geography of Strabo. II. London: Henry G. Bohn. pp. 7–34. ^ Koumouzelis, M. (1980). The Early and Middle Helladic Periods in Elis (PhD). Brandeis University. pp. 55–62. ^ Robinson, Eric W. (1997). The First Democracies: Early Popular Government Outside Athens. Stuttgart: Steiner. pp. 108–111. ISBN 3-515-06951-8. ^ a b Robinson, Eric W. (2011). Democracy Beyond Athens: Popular Government in the Greek Classical Age. Cambridge: Cambridge University Press. ISBN 978-0-521-84331-7. ^ Smith, William. Ancient Library. ^ Athenaeus. Deipnosophistae, VIII 350a. ^ Towle, James A. Commentary on Plato: Protagoras, 341c. ^ Sophie Minon. Les Inscriptions Éléennes Dialectales (VI-II siècle avant J.-C.). Volume I: Textes. Volume II: Grammaire et Vocabulaire Institutionnel. École Pratique des Hautes Études Sciences historiques et philogiques III. Hautes Études du Monde Gréco-Romain 38. Genève: Librairie Droz S.A., 2007. ISBN 978-2-600-01130-3. Chisholm, Hugh, ed. (1911). "Elis (district)" . Encyclopædia Britannica (11th ed.). Cambridge University Press. Chisholm, Hugh, ed. (1911). "Elis (city)" . Encyclopædia Britannica (11th ed.). Cambridge University Press. Chisholm, Hugh, ed. (1911). "Elis, Philosophical School of" . Encyclopædia Britannica (11th ed.). Cambridge University Press. Wikimedia Commons has media related to Ancient Elis. Mait Kõiv, Early History of Elis and Pisa: Invented or Evolving Traditions?